1. I am glad we put up a screen house. Sitting in it most evenings until dark protects us from the outrageous number of mosquitoes flying around searching for food. A few weeks ago when the humid weather had engulfed us for days, the Pres and I listened to the eagles going on and on for over a half hour. 2. Sometimes the Pres comes up with a good one. It was then that the Pres suggested that I try going in at dusk to see if I could catch some activity. "I'll be eaten alive, honey!" I said quickly watching the mosquito buzzing around the outside of the screen. You see, I have this thing about bugs. 3. The Pres has quite a collection of hunting attire...things that he's acquired over years and years of hunting. He went on, "I just remembered I have a hat you can wear. I used it for turkey hunting. The eagles won't even see you and the bugs can't get you either." Now, all he had to do was remember where he'd stashed it. I became more curious and couldn't wait to see what he had for me because I love surprises! 4. When we came in after I'd cleaned up the kitchen, he came up behind me while I was facing the sink and placed something on my head. Feeling him fastening the back, he then said, "There you go. You're all set. Go look in the mirror. I can't even see your face!" 5. He was right. Can you? Hey JP, you are rady to fend off those skeeters and nearby any other bug it seems, but how can you see to take photos? 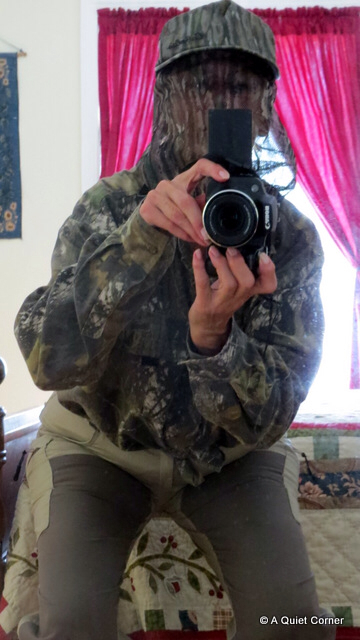 how do folks go hunting when they look so silly?? where's your blaze orange? I cannot say what my first thought was... but it cracked me up. I cant stop laughing.. This is hilarious .. Oh.gosh.. no Icant see your face..
you would be sure well protected.. ha ha ha ..
You will be well protected against bugs--and you'll scare off anything else! :-) This gave me my big smile for the day. Ha! So I guess that get-up worked well? Nope! Can't see your face even a tiny bit. lol. That's quite a hat. I would definitely want something like that to protect me from mosquitoes. I have a THING about bugs too. Blech. You look like you're having fun too! you look like you'd scare any mosquitoes away, too funny!